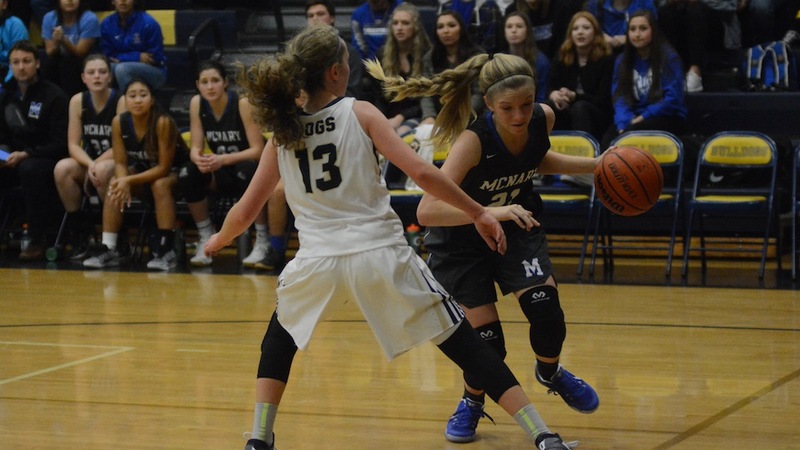 McNary sophomore Abigail Hawley had 10 points off the bench in a 48-41 loss at West Albany. ALBANY—McNary girls basketball coach Derick Handley said before the season started that the Greater Valley Conference had improved. At West Albany, he found out just how much as the Lady Celts opened league play Friday, Dec. 9 with a 48-41 loss. MHS swept the Bulldogs last season, outscoring them 128-58. The two teams played to a 4-4 tie through the first quarter as the Lady Celts struggled to attack West Albany’s zone defense. The scoring picked up in the second quarter as sophomore Abigail Hawley came off the bench to knock down a 3-pointer and give McNary a 9-6 lead. But the Bulldogs answered with a 3-pointer of their own to tie the game. Senior Sydney Hunter then picked up two quick fouls and went to the bench. In Hunter’s absence, Hawley continued to lead on the offensive end, making another 3-pointer, despite being fouled, to give MHS a 14-11 lead. She then knocked down the free throw to complete the 4-point play. West Albany kept answering but two baskets by McNary junior Paige Downer kept the Lady Celts on top, 22-21, with less than a minute remaining in the second quarter. However, the Bulldogs scored five points in the final 15 seconds, including a long 3-pointer at the buzzer to lead 26-22 at intermission. Playing a smaller lineup, McNary, led by Hunter and Kailey Doutt, opened the second half on a 10-0 run to go ahead 32-26 with 3:17 remaining in the third quarter. Smith ended the run with a field goal and added a 3-pointer to get West Albany within 34-30. Hunter then picked up her fourth foul with 1:18 left in the third. After the Bulldogs got within 34-32, Hawley knocked down another 3-pointer at the 1:02 mark but that was the last field goal the Lady Celts would make. The Bulldogs opened the fourth quarter on a 12-2 run to take a 45-39 lead with only 2:30 remaining. After Hunter made two free throws to get McNary within 41-45, Jaylene Montano then forced a West Albany turnover to give the Lady Celts a chance. However, MHS turned the ball right back over and weren’t able score the rest of the night. The Lady Celts were 4-for-21 from behind the 3-point arc. Despite foul trouble, Hunter was able to post a double-double of 14 points and 13 rebounds. Hawley and Doutt each had 10 points. The loss was the first for McNary, who opened the season 3-0. 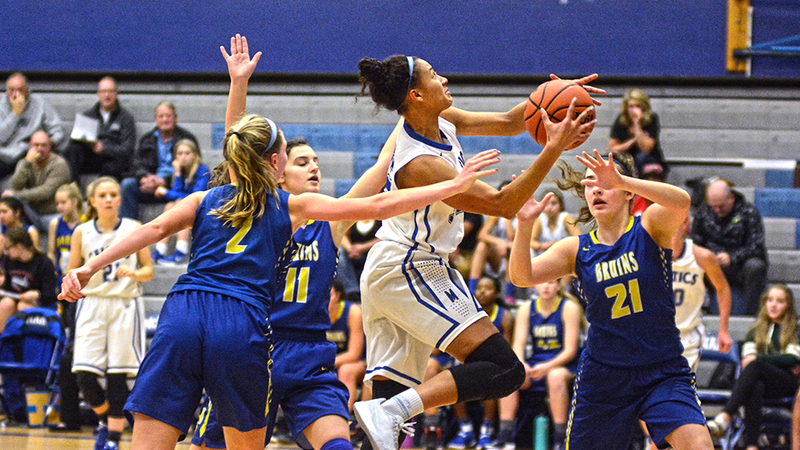 With the graduation of three of its top four scorers, McNary is looking for girls to step up and put the ball in the basket. For game one, it was Jaylene Montano and Kailey Doutt, who combined for 27 points as the Lady Celts rolled past Barlow 58-23 at home on Thursday, Dec. 1. Montano, a senior point guard, knocked down two three-pointers in the first 1:05 to give McNary a quick 6-0 lead. Doutt, a junior, finished with 12 points, including six in the first half as the Lady Celts went into intermission with a commanding 26-7 lead. Montano’s hot shooting continued in the second half as she made three more 3-pointers in the third quarter to finish the game with 15 points by going a perfect 5-for-5 from behind the arc. With McNary up 47-15, Montano didn’t play in the fourth quarter. “Her (Montano) and Kailey Doutt are two girls that we’ve talked a lot to the last couple of days,” Handley said. “For us to be successful we need them to have confidence in the outside shot and for Jaylene I think the first one falling kind of got her going for the rest of the day. I’m hoping that it can be consistent. It’s not one of those she needs to make the first one to keep it going but she is such a steady player for us. Senior Sydney Hunter got into foul trouble, picking up her third on a charge three minutes into the second quarter, but still managed a double-double of 14 points and 11 rebounds. In her absence, sophomores Abigail Hawley and Anita Lao got more playing time. Hawley finished with three points, five assists and four rebounds. Lao added five points, two assists and three rebounds. Koenig finished with four points and three rebounds off the bench. Committing fouls was a problem for the Lady Celts in the first half. Barlow was in the double bonus midway through the second quarter but went just 3-for-10 from the free throw line in the first half. The Lady Bruins were also held to just two field goals, one in each quarter. The Lady Celts got revenge on Tualatin Saturday, Dec. 3. The Lady Timberwolves had won the two previous matchups but McNary won the latest 55-51. Doutt had 18 points, eight rebounds, three assists and two steals. Hunter was also in double figures with 14 points, nine rebounds, three assists and three blocks. The Lady Celts improved to 3-0 Tuesday, Dec. 6 with a 44-43 win at Sheldon. Hunter had another double-double of 16 points and 15 rebounds to go along with three assists, four steals and three blocks. Doutt added 12 points and nine rebounds..
McNary opens GVC play Friday, Dec. 9 at West Albany.